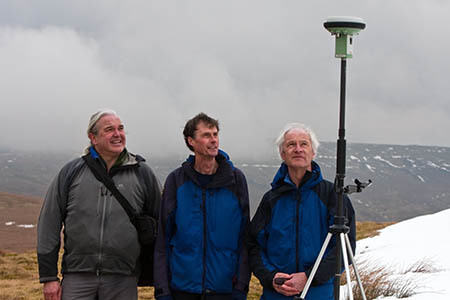 A trio of amateur hills sleuths are planning their most adventurous surveying trip so far. The men, who use professional-standard technology to measure the heights of hills, have their sights set on a wild rocky peak in the Skye Cuillin range. Graham Jackson, John Barnard and Myrddyn Phillips will head to the Hebridean isle next month to determine the height of Knight’s Peak, a subsidiary of Sgùrr nan Gillean. The rocky peak is currently classed as a munro top, and Ordnance Survey maps give its height as 915m – a fraction of an inch short of 3,002ft in old money. 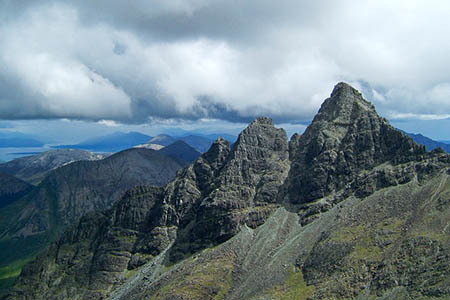 The minimum height for a munro top is 3,000ft. The excursion has the blessing of the Scottish Mountaineering Club which keeps the list of munros and subsidiary tops and the Munro Society, which is open to people who have summited all 282 munros. 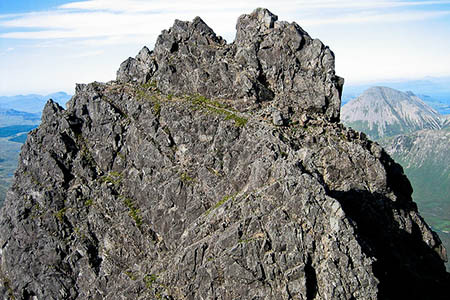 Knight’s Peak, named after W Knight, who along with a local guide made the first recorded ascent in 1873, is on Pinnacle Ridge, a difficult ascent route of Sgùrr nan Gillean. Its ascent involves a scramble and measuring its height will present the trio with new challenges. Myrddyn Phillips said: “Two options vie for the summit, the first of which can accommodate one person standing on top, whilst the other rises to such a point that it is ill advised to attempt to stand on it. “Both summit contenders have sheer drops beyond. The height of the rocky peak has been the subject of conjecture for years. It first appeared as a munro top – a 3,000ft subsidiary peak – in the 1997 revision of the Munro’s Tables. Its height on various maps has been marked variously as 2,992ft, 2,994ft, 2,999ft and 3,003ft. The amateur sleuths, who are known as G and J Surveys, will try to nail a definitive height for the rocky outcrop, using high-end GPS equipment over a period of time on the mountain. They will travel to Skye on 10 September and keep their fingers crossed for a suitable weather window to carry out the survey. G and J Surveys was formed by Graham Jackson and John Barnard in June 2006. Myrddyn Phillips joined them in May 2007. They carried out the surveys that have reclassified Sgùrr nan Ceannaichean and Beinn a’ Chlaidheimh from munro to corbett status, as well as determining that Buidhe Bheinn was the higher summit of the twin corbett. South of the border their surveys have elevated Mynydd Graig Goch and Thack Moor to 2,000ft mountain status. A lovely day with my wife on Pinnacle Ridge (which includes Knight's Peak) a few years back. A "proper" mountaineering day out, even if it turns out Knight's Peak isn't a Munro Top. It's an excellent photo Gerald. It'd had my knees wobbling ever since I came across it on the Geograph website!